Anyone remembers writing essays for English class knows that authors use more than just words to communicate their story – their words hand on an invisible scaffold of literary and narrative devices. For my MA thesis, I treated the printed page as a piece of information design – using grid structure, layout principles and typography to expose the hidden layers inside a text. As an experiment I mapped Jorge L. Borges’s ‘The Garden of the Forking Paths’ – a classic nonlinear short story with multiple realities and a big twist ending. Final poster is printed on extra thin "bible paper" so the verso imagery will show through the page. 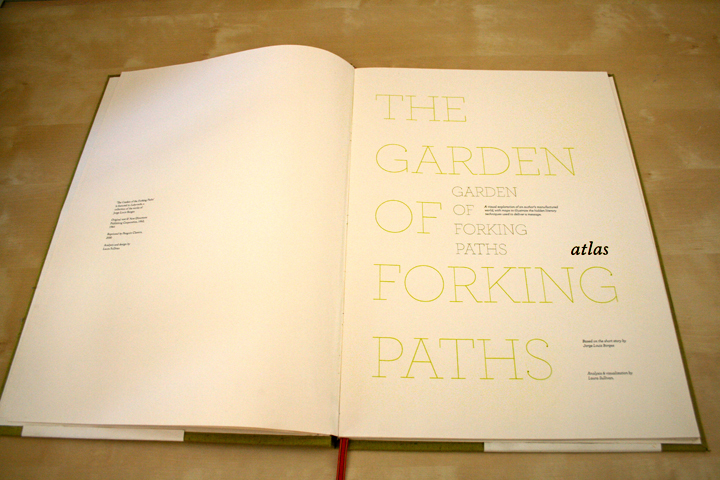 Left: The Garden of Forking Paths threads together different genres, times, spaces and realities. In this piece, every narrative thread has its own typographic signature. For instance, whenever the story turns back to the past, the text reverses its direction. The importance of every statement is also mapped. Critical moments are larger and bolder than more insignificant passages. Above: In the final printed piece, text and image are separated and printed on opposite sides of very thin bible paper. This technique allowed the images (taken from historical sources) to bled through the fictional text. While the overview gave a general picture of the short story, the key to Borges's narrative lies within the revelatory conversation between the two main characters and their changing roles in the plot. Interpreted as a visual character study, this map reflects the shifting realities and Borges's devastating conclusion. Left: Both posters were bound together in an atlas, a visual representation of the world behind Borges's text.